says it quite that way – but that’s the message. “Strengthen your hearts,” Saint Paul says. and second, so they make good judgments. You have to be ready to go at a moment’s notice. Not in six hours, but right now. even if we’re not intoxicated, it will still affect us. and it can add to good cheer. with a very large quantity of very fine wine at their wedding in Cana. we learn soon enough that there is a line. Beyond that line, and we aren’t just merry; we become stupid. when kids do it, it is often catastrophic. That is why adults don’t want kids drinking. Not to keep you from sharing the fun, but to keep you from disaster. and to avoid getting too close to it. is about more than drinking. Every few weeks or months, I think about quitting Facebook. If I am not careful, I get drawn into some really dumb things. Maybe it’s harmless fun; maybe it’s an argument. It’s all a huge time-waster; yet it’s strangely attractive. Same with the Internet in general. I have a theory. And I have absolutely zero proof for this theory. it won’t happen on the Internet. as they argue over whose kitten video is better! Stay sober and alert, Jesus tells us. This isn’t just about the final coming of Jesus at the end of time. for the moments of truth that come in our lives all the time. we watched TV together. Nothing wrong with that. But if I could go back in time, do you know what I’d do? it’s too late for me to ask now, because he’s gone. Be vigilant: life is happening now. God’s grace is happening now. Are you awake to it? If God is acting, if God is talking, how do we know? How do we see it, or hear it? and all the small stuff become too important. God IS talking to us; but usually in a quiet voice. and sitting or walking in the silence, to hear him. consider what Jesus told us to do so many times. What did he hope to find us doing, when he returned? Feeding the poor, clothing the naked, visiting the sick and the forgotten. who have suffered painful losses recently. Reach out to them. that would love to have some additional volunteers. Would you like to serve Jesus a meal? You will find him at those soup kitchens. this week we’re looking at the story of salvation. God created us, humanity was wrecked by sin, and God acts to save us. and it will be completed at the end of time. mine, ours, and those of everyone we know. And he is asking each of us to do our part. we seldom see how our own part even matters. So much of what’s going on around us is confusing and disheartening. Most of our tasks are unglamorous and tedious. about someone I’ve known a long time who was in the hospital. That person and I had been close, but we’d been at odds many times. There was a lot of hurt – and I wasn’t sure if I would go visit. I told myself, maybe it wouldn’t even be welcome. I can always go later. But I knew that was wrong. I did go. In fact, my visit was welcome. There were apologies and tears. I am glad I went. Did it change the big picture? I cannot know that. But one thing I do know is that Jesus wanted me to make that visit. it’s what he told every one of us to do. but seventy times seven times. we will be ready to go and do what the Lord asks, at a moment’s notice. What did Father make for Thanksgiving? I enjoyed Thanksgiving at my cousin's house, with some of his family and mine. With his and my parents gone, our siblings are scattered over half the country, and we do not often get together. My cousin has lost two of his brothers; I am blessed to say all my siblings are still on their earthly journey. 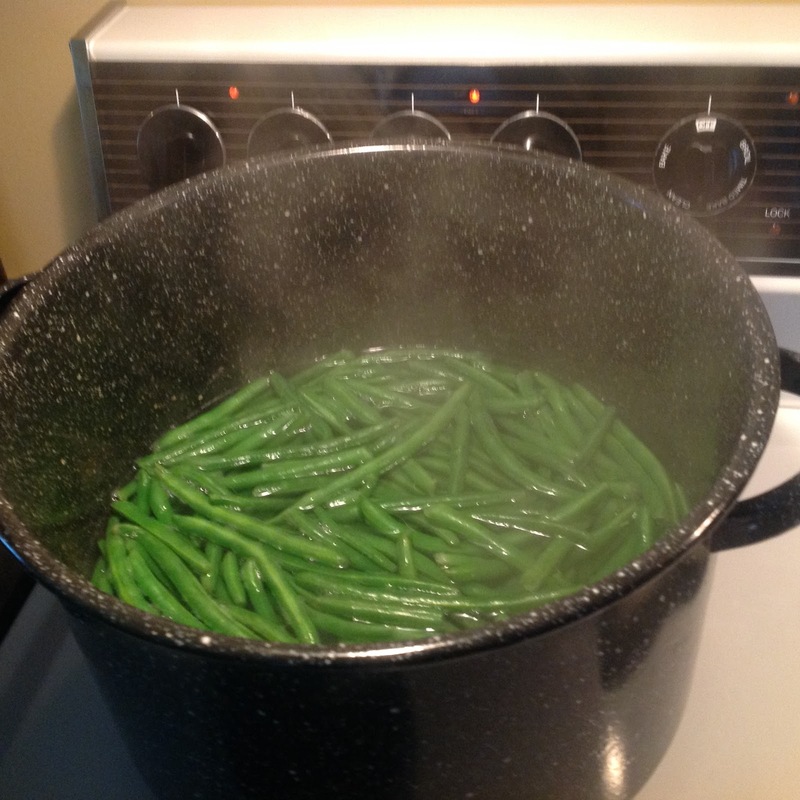 So, I started with water, heated to boiling, for the fresh green beans. I used a two-pound package. 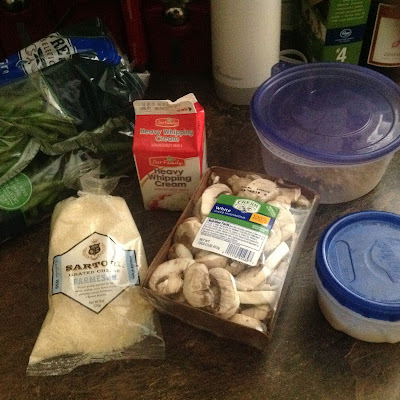 Here are all the other ingredients, spread out. 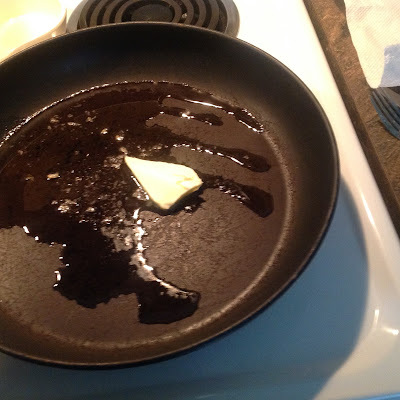 This is both bacon fat, as well as some butter, melting in the pan. The bacon fat was poured off the "baconator" (a plastic rack for cooking bacon in the microwave). Sorry I didn't get a picture of that. I cooked up about 20 slices of bacon, as called for. In go the sliced mushrooms. Not all of them, however. I was following the recipe; in retrospect, I might easily have doubled, or tripled, the amount of mushrooms. The recipe didn't call for it, but I wanted onions. So I sliced one up, and sauteed it in butter. 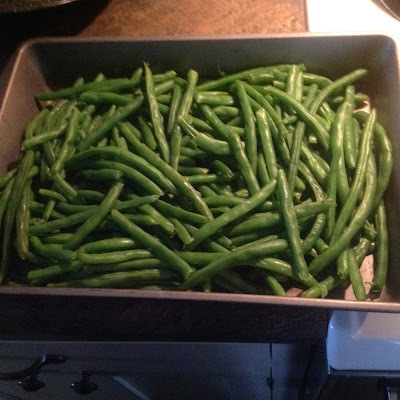 Again, in retrospect, I might easily have doubled the quantity. 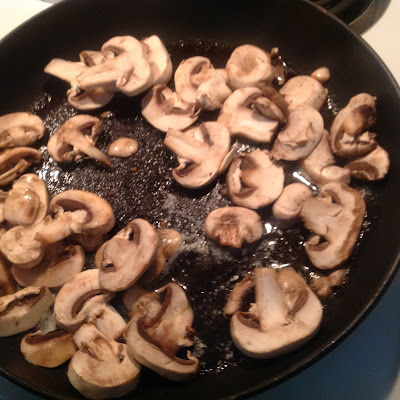 The mushrooms cooked up nicely, especially with much added garlic powder. 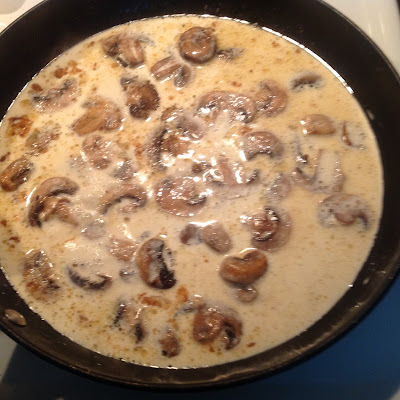 FYI, this is a nice way to cook mushrooms: just butter (or oil or fat), salt, pepper, and LOTS of garlic powder, especially toward the end. The garlic coats the mushrooms. I like to make mushrooms that way as a side dish to a steak. 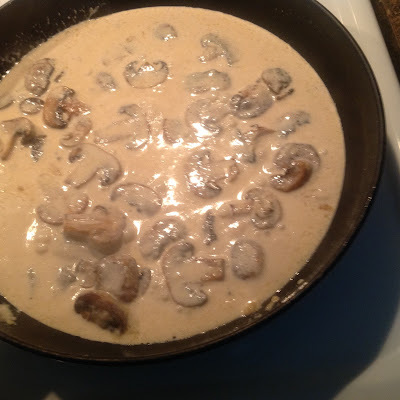 Here, I added nearly a pint of heavy cream (I say "nearly," because I'd used some of it for something else, I don't recall what. I figured it would be enough). Here are the beans, out of the water, into the baking pan. No, it's not a very pretty pan. I tend to cook my vegetables a little firmer. That's how I like them. 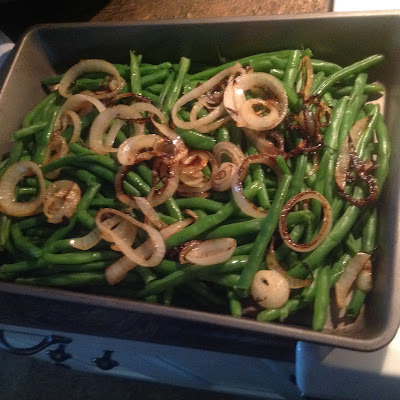 Here are the onions, just about to go on the beans. 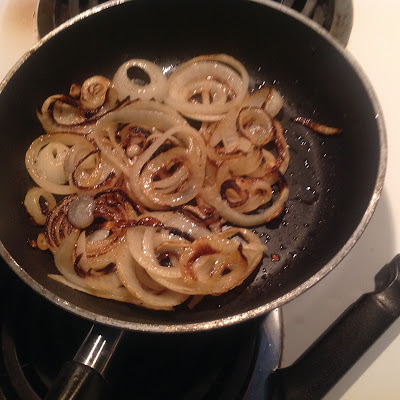 By the way, this is also a very nice way to cook onions as a side dish. Just add salt and pepper. 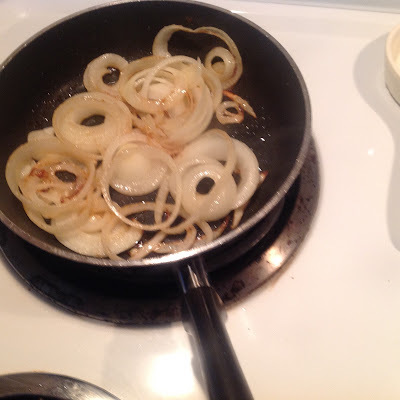 I like the onions with a bit of browning like this. The recipe called for thickening the cream. 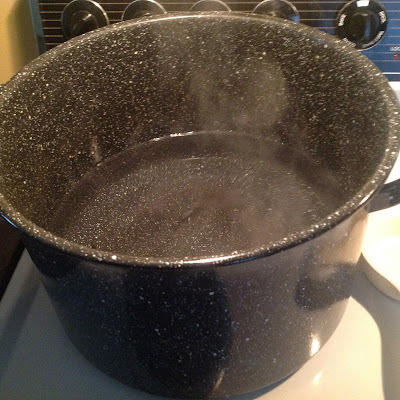 I don't think I thickened it enough, but I was getting impatient to get on the road. If I do this again, I'll cook it longer. All around the inside of the bowl of the food processor was a light dusting of fine grains of bacon. Pixie dust is imaginary; bacon dust, I am pleased to inform you, is real! And delicious! Magically delicious! If I could have gotten my head inside that bowl, to lick it out, I would have. At any rate, here's the bacon on top of the casserole. I actually only used about half of it. You'll also notice some parmesan cheese, which I put on first. In fact, this is where I cleverly used a leftover. The other day, I made some fish, and that recipe called for coating the fish in a mixture of parmesan cheese and ground almonds. I had a good quantity of that mixture left over, and this seemed a perfect use for it. Almond go nicely with green beans. So I took the unbaked casserole to Cincinnati and my cousin's girlfriend put it in the oven for 30 minutes. 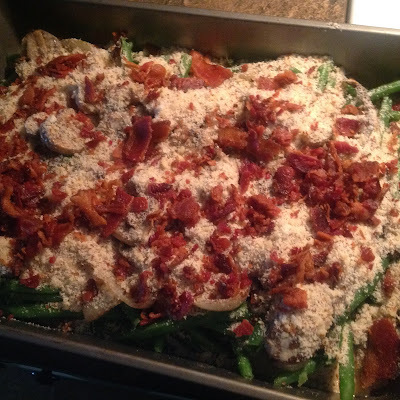 Everyone seemed to like it, but honestly, I missed the dish my loving aunt would have made. The cream sauce, being thinner, tended to stay to the bottom of the pan. Perhaps had I mixed it with the cheese beforehand? Or else cooked it down further. This feast of Christ the King was established by Pope Pius XI in 1925. It wasn’t an idea that just came out of the blue. The Holy Father was reflecting deeply on the trends of his time. and had published his manifesto for Nazism. needed to be reminded: Jesus Christ is the only rightful king! of a lasting peace among nations. Men must look for the peace of Christ in the Kingdom of Christ. It’s just as true today as nearly 100 years ago. Jesus Christ the sole, rightful king of this world. Again, Pope Pius said that this concerns the spiritual life. is subject to the reign of Jesus Christ! they will come to know Jesus is Lord. Jesus Christ and his teaching influence them. Let’s take this another step, however. “we the people” are sovereign. We choose who makes the laws, and we can replace them. So Pope Pius’ words are really directed to us. 1) To be well informed as we reasonably can, as citizens. 2) To be registered to vote, and to then to cast our votes at every election. 3) To cast our votes at all times in a way consistent with Christ’s Law. meaning between a man and a woman. But who gave them the power? yet he was elected with the help of millions of Catholics. the five justices who did that were all Republican appointees. and to treat some groups as second-class citizens. to any of these grave offenses to human dignity. they are pushing King Jesus outside the voting booth! because it originates in heaven. No one makes Jesus king; he is God. for what reason did he even come? in this world, but only in the world to come! But we know Jesus himself said no such thing. then where do you and I allow him to be king? Do I let him reign over my thoughts? Or, do I let bigotry and vengeance find place in my mind and heart? how can worry and fear find a place there? Does Jesus govern my hands? Or do they sometimes strike in anger? Does Jesus control my tongue? Lord, have mercy! Is Jesus king over our computers and our TVs? Or are there places we go online that dishonor him and his creation? in the sacrament of confession. but what about our own homes and our families? What about the priorities of our time and money? These things we can surrender to Jesus Christ, our sovereign king. In the wake of the terror attacks in Beirut and Paris last week has come a wave of politicians and others calling for refugees from the Middle East not to be settled in Europe and the U.S. As typically happens, the strength of emotions voiced in this protest -- directed, in this country, against President Obama and his administration -- is matched by an equally emotional response: people who object to admitting refugees are stupid (one Facebook commenter kept calling everyone who disagreed with admitting refugees "a**hat"), not very Christian (so says Mark Shea), cowardly (so said the great uniter, President Obama); well, you get the idea. Well, it's not an obvious call. So said, of all people, far-left Mother Jones: Liberals Should Knock Off the Mockery Over Calls to Limit Syrian Refugees. In the Mother Jones article cited above, you'll see reference to screening of refugees, which "is already pretty tight." If so, this is good to know. So says Mr. Shea, in one of his less bombastic moments. He provides these links about that screening, which I pass along to you. (Full disclosure: I comment periodically on Mr. Shea's blog, but not under my own name.) Let us note, for example, that the proposal is to admit 10,000 refugees from Syria; and if the NPR report cited above is correct, "half of those who have been admitted are children and about a quarter of them are adults over 60. Officials say 2 percent are single males of combat age." Ah, but this comes from the Obama Administration. Do we have reason to be skeptical? Yes, I think we do. The Obama Administration has tied itself into pretzels trying to be politically correct about all this, with only grudging acknowledgement of the suffering of Christians in the Middle East, avoiding any reference to the obvious fact of so much of this terror being rooted in an extreme expression of Islam -- not to mention this administration's choice to be a hand-wringing, impotent observer during the tragedy of the Syrian Civil War. So, do Americans have reason to be distrustful of President Obama, given his record? Sorry to say, but yes, I think we do. And yet, with all that, I think there is no question that we -- we who are Catholics, we who are Christians, we Americans who want to be true to our national values -- ought to accept refugees. No, this isn't like the decision to turn away Jews fleeing Europe in the World War II years. The analogy is false every which way. To refer back to the Mother Jones article, above: the reason people are voicing alarm is rooted precisely in the problem of would-be terrorists entering in the same wave. I defy anyone to show where there was any serious concern, in the '30s and '40s, that there were terrorists or saboteurs among the Jewish refugees. 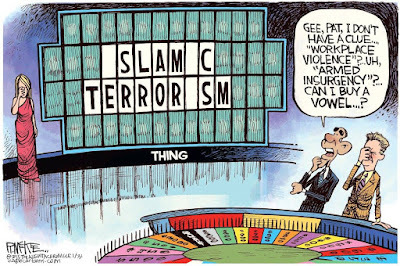 If President Obama -- instead of aggravating the situation with his taunting -- were to announce that 100% of the refugees we accept will be Christians, or non-Muslim minorities, or else only women, elderly and children, I predict the opposition would evaporate. It's also outrageous to indict the American character, which is what the President's "progressive" allies do reflexively. No nation on earth is more open to refugees, to immigrants, and to diverse cultures. And it is precisely because of this openness that there is a real vulnerability. By the way, one of the points being made against resettling refugees here is that they have found refuge elsewhere. And that's true. However, let's note that three countries in particular are harboring vast numbers of refugees: Turkey, Jordan and Lebanon. I listed them in order of their stability, because this is a major concern. There is a very good argument to be made that alleviating the destabilization of these countries -- on the frontline of the area where ISIS is operating -- is most definitely in our national interest, as well as a manifest humanitarian interest. If you do a little searching online, you'll discover that millions of refugees are living in these areas. Perhaps these three countries can handle it; but if not, is that really hard to believe? It also occurs to me that helping Turkey with its refugee problem may well be a price to be paid for them to acquiesce in the U.S. helping the Kurds fight ISIS. As it stands, the Kurds seem to be our most reliable allies on the ground, shooting back at the ISIS. It seems obvious to me that the best course of action for the U.S. is to partner with the Kurds; but Iraq, Iran and Turkey all have reason to oppose any such move, because it threatens the creation of an independent Kurdistan, or something short of it. While the U.S. can reasonably get away with ignoring Iranian and Iraqi objections, ignoring Turkish complaints is not so easy. Now, I have no idea is this is, indeed, what the administration is doing, it's just possible; I saw recently that we are doing more to help the Kurds. If so, good for the President. But the question remains, how are we keeping the Turks happy? Accepting refugees may be part of it. I am not ignoring the danger of would-be jihadis entering along with these refugees. I have three thoughts about that. First, if indeed, only 2 percent of the refugees we are accepting are males of military age, then it wouldn't be so hard, would it, either to refuse that 2 percent? Second, the reality is that our borders are fairly porous -- and not only because of insufficient immigration policies, especially regarding our southern border. We have problems with unaccounted immigrants, not to mention home-grown jihadis, because ours is an open society. Aside from the many millions who come here illegally, our nation admits millions of people legally -- and a good number of them stay longer than they should. This is very hard for a free society to prevent. My sense is this -- and I say this without bombast or chest-thumping moral superiority -- that refusing to help these refugees isn't going to make much difference, if any, regarding the real threat of jihadis entering our nation. If, indeed, the refugees are carefully screened, my guess is the bomb-throwers will seek other ways in. Further, being compassionate toward these refugees doesn't mean we have to give them the run of the place. We're admitting them so they can be fed, housed and live in a decent fashion. There's nothing uncompassionate about this being temporary -- i.e., until such time as they can return home safely. That is to say, admitting refugees isn't the same as granting them permanent residence or citizenship. Finally, as Christians, obeying the Lord's commands are not conditional on risk. Following Jesus means risking ridicule and opposition, giving up everything for him, and finally embracing the cross. At some point, we have to place some trust in God that when we do what honors him, he will respond generously. Sorry for the delay in reporting on my homily. I was traveling most of last week, so I didn't really have much time to write out my homily. Then, Sunday afternoon, I drove over to Columbus to take our parish seminarians out to dinner; so I didn't take time to write a post Sunday or Monday. - I explained what the "four last things are": death, judgment, heaven and hell, and why they are associated with this time of year (the end of the liturgical year; moving from fall to winter in northern hemisphere, the readings). - We all die; but we often imagine death is far away. Referring to my recent travel, I said that being in an airplane -- a tube of metal, 30,000 feet high, with nothing but air beneath me -- has a way of making death a little more real. I described my own practice of an act of contrition and the St. Michael prayer on take-off, and a Glory Be and Hail Mary on a safe landing; and lots more prayers if we hit a rough patch! And, I said that being on a plane, knowing I wasn't in a state of grace, isn't fun. Better to go to confession! - I talked about Father Tom Grilliot, who in his last several years, spoke candidly about his mortality because of his cancer. It's important to talk about death, not avoid talking about it. - There are two judgments: our particular judgment when we die, and the general judgment when Jesus brings things to a close. We are judged on our faith and works; but we can't do works to make up for lack of faith. No one can impress God with his or her good deeds. Faith -- love of God -- is necessary; but works must follow. As Saint James said, faith without works is dead. We also have a choice: we can be judged strictly or with mercy: recall Jesus said, by the measure you measure, so shall it be measured out to you. If we are harsh, the standard applied to us will be as well. - I talked a bit about both heaven and hell. We can't expect to enter heaven without friendship with God; because, what would we do in heaven if we don't want to be with God? It would be like being in a Baskin Robbins store for eternity, but not liking ice cream. - I talked more about the resurrection, which comes at the Last Day. We get our bodies back, yet new and improved. Our bodies aren't shells; we don't wear them, and then discard them. We are body-spirit; that's how God created us and that wholeness will be restored. This has implications. First, that our bodies matter, and what we do in the body matters. Second, Creation matters. I mentioned Laudato Si in reference to respect for creation as reflecting God's glory. - I cited something St. Augustine said (although I rephrased it): if we are friends with God, why are we afraid to meet him? how much are you and I willing to give to Jesus Christ? It’s not necessarily a matter of money. The widow in the Gospel didn’t just give a donation. As Jesus said, she gave everything she had to live on. She put everything on the line. How much will we put on the line? in which he posed a similar question. He asked whether we are really putting anything at risk for our faith. whether we believe in Jesus Christ or not. We would probably have the same job, the same life, and so forth. I think that is more true than it is comfortable to admit. for our Archdiocese from Clifton, in Cincinnati. He’s putting his life on the line. from what otherwise it might have. He wouldn’t be doing that if he didn’t believe in Jesus Christ. eternal life, with their children. They are thinking not only of this world, but the world to come. because of the words of Christ and for love of him. Still, there’s that widow. Not a rich person. A poor widow. She gave not just something, but everything she had. which is really between each of us, and Jesus himself. He’s the one who makes the invitation. left their nets; their livelihood; everything they had. Your Creator and Redeemer speaks to you as only he can. He has prepared your life and given you your gifts. and when he came back to life, he said he’d been in heaven. It’s not the only book that’s been written about heaven. A lot of us wonder: what might heaven be like? Well, let’s look at what the Scriptures we heard have to say. First, Heaven will be full of people. or we’re out of work, or we have problems at home. Second, Heaven is full of holiness – and, therefore, joy. Hands that are sinless and a clean heart. we have lust, we have bad habits. But it would be truer to understand sin as being about what we lack. We lack the fullness of purity; of peace; of contentment; of truth. We lack the fullness, finally, of God. but because of what we think we don’t have. Isn’t that what envy is? I have no reason to envy my neighbor. and, ultimately, the final judge is God. God is doing a good job as the final judge of things. Heaven is free of sin, precisely because it’s full of God. Just because heaven is full, don’t assume heaven is easy. is that pretty much everyone goes to heaven. Only really bad people, like Stalin and Hitler, go to hell. Well, that’s not what Jesus said. Jesus said a lot about hell. He kept warning people about how likely it was they would go there. to be more than five or ten pages long. And, more than that, Jesus would never have died on the cross. Remember, he agonized about it the night before. So am I now contradicting my claim, earlier, about hope? only because we surrender ourselves to the grace of God. which is the same thing as saying, she is without sin. every one of us is destined to receive. Every one of us is destined to be full of grace. In other words, every single one of us is meant to be a saint. Let me make the point even more strongly. If you and I don’t make as saints? Then we will be in hell. There is no middle option. it’s the last stop before heaven. And everyone who makes to Purgatory will be a saint. Purgatory is the finishing school for saints. then you and I had better get serious about being saints. This is a good time to highlight the cards in the pews. the white and blue cards down the aisle. which we have available to everyone, for free. We watch the first part of the Symbolon series. who Jesus is and what he does for us. there’s where we’ll talk about how we get to heaven. fill out the blue card. Go ahead and do it now. committing to watching the video series. Now, don’t agonize over this; it’s not a contract or anything. This isn’t a class; no tests, no grades! If you’re not sure you can attend all the sessions, don’t worry about it. This is an invitation and an opportunity. with your family or with some friends. That’s fine! Just note that on the card as well. or next week, if you prefer. Or you can drop it off at the office. The white card is for you to take home. for finding the materials online. I looked at the first video, and it was beautifully done. to see something so high-quality being available. and giving their lives to Jesus, as a result of this program. who responds by giving his life to us. the love and the life, of Jesus Christ. whose lives are washed clean in the blood of the Lamb.